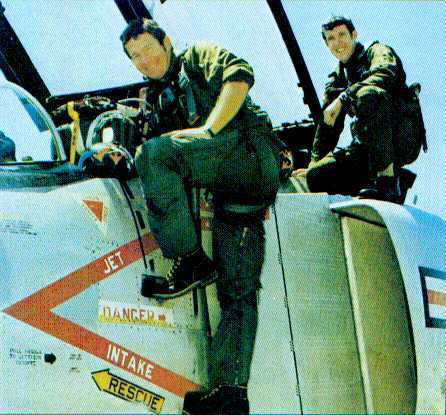 LT Randy "Duke" Cunningham and LT Willie "Irish" Driscole(Image 1) flew an F-4J Phantom II from the USS Constellation, CV-64, on Yankee Station in the Gulf of Tonkin. Showtime 100 was CAG's "Double Nuts" Bird, but was assigned to Cunningham and Driscole for that day's mission. Tasked with a strike mission that day, Cunningham was loaded with snakeyes, 2 Aim-7E Sparrow SARH Missles, and 4 AIM-9J Sidewinder IR Missles(rear aspect only). After delivering the ground ordnance on target, a rail yard, Showtime 100 took up a covering position for the A-7 Fighter Bombers still hitting the area. In response to a call for help Cunningham took his F-4J into "a pack" of MIG-17s that were attacking the bombers and was promptly jumped by two Frescos. 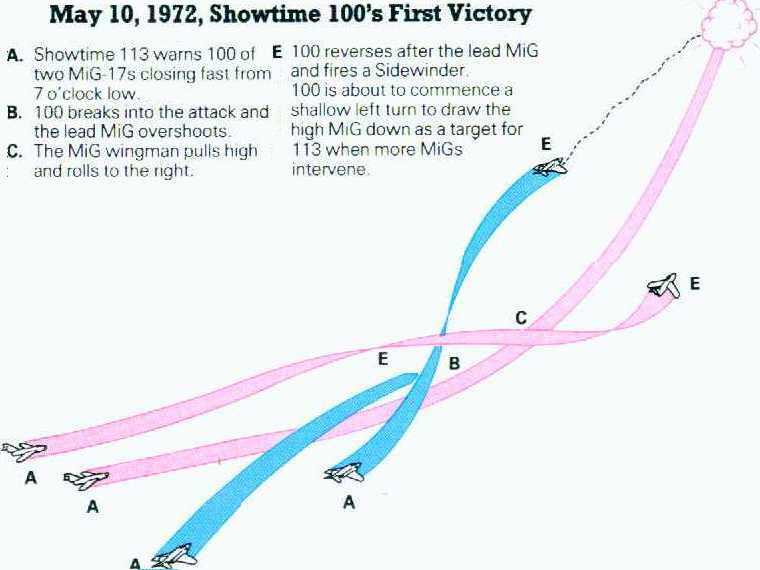 Heeding a "break" warning from Showtime 113, Cunningham broke into the two pursuing MIG-17s(Image 2)and causes the lead MIG-17 to overshoot. 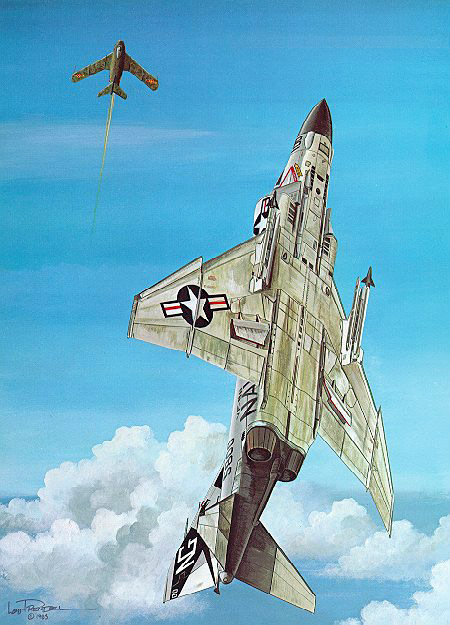 Cunningham then reverses his turn and engages and destroys this MIG with a Sidewinder missle. After attempting to "drag" the remaining MIG for his wingman to engage he is forced to disengage when both he and his wingman are jumped by additional MIG-17s and a pair of MIG-19s. After eluding the additional MIG-17s and 19s, Showtime 100 rejoins his wingman and observes another group of MIG-17s in a "Wagon wheel" defensive formation. Unfortunately, several F-4s were also engaged with the MIGs within the "wheel", and thus were at an extreme disadvantage, due to their low energy state, with the more maneuverable MIGs. Seeing the XO's F-4J(Showtime 112) in danger from a MIG-17 that is in the XO's blind six, he calls for him to "break"(to clear the hotter F-4's twin J-79 Engines from the Sidewinder missle's heat seeker and therefore obtaining a clear lock on the bandit). Unfortunately this initial call goes unheeded(due to the XO thinking the warning was about two additional MIGs out of range on his six o'clock). After being forced to disengage by additional threats and then evading them, Cunningham re-engages the MIG-17 threatening his XO's Phantom. Again calling for him to break, and adding... "If you dont break NOW you are going to Die" the XO finally accelerates and breaks hard right leaving "Duke" clear to fire on the pursuring MIG-17(Image 3). The MIG attempted to follow the XO's aircraft but could not turn at that higher speed[MIG-17s have control problems over 450 knots]. Quoted directly from Randy "Duke" Cunningham from his book "Fox Two"
"As we headed for the coast at 10,000 feet, I spotted another aircraft on the nose, slightly low, heading straight for us. It was a MIG-17. I told Irish [Willie Driscole, my RIO] to watch how close we could pass the MIG to take out as much lateral separation as possible so he could not convert as easily to our six o’clock. We used to do the same thing against the A-4s back at Miramar since the two aircraft were virtually identical in performance. This proved to be my first near-fatal mistake....A-4s don’t have guns in the nose. The MIG s entire nose lit up like a Christmas tree! Pumpkin-sized BB s went sailing by our F-4. I pulled sharply into the pure vertical to destroy the [enemy’s*] tracking solution. As I came out of the six-G pull-up I strained to see the MIG below as my F-4 went straight up. I was sure it would go into a horizontal turn, or just run as most had done in the past. As I looked back over my ejection seat I got the surprise of my life: there was the MIG, canopy to canopy with me barely 300 feet away!…I began to feel numb. My stomach grabbed at me in knots. There was no fear in the guy’s eyes as we zoomed some 8,000 feet straight up. I lit the afterburners and started to out climb my adversary, but this excess performance placed me above him. As I started to pull over the top, he began shooting. My second near-fatal mistake-I had given him a predictable flight path, and he had taken advantage of it. I was forced to roll and pull to the other side. He pulled in right behind me. Not wanting to admit this guy was beating me, I blurted to Willie, "That S.O.B. is really lucky! All right, we’ll get this guy now!" I pulled down to accelerate with the MIG at my four o’clock. I watched and waited until he committed his nose down, then pulled up into him and rolled over the top, placing me at his five o’clock. Even though I was too close with too much angle-off his tail to fire a missile, the maneuver placed me in an advantageous position. I thought I had out flown him-overconfidence replaced fear. I pulled down, holding top rudder, to press for a shot, and he pulled up into me, shooting! I thought, "Oh, no maybe this guy isn’t just lucky after all!" He used the same maneuver I had attempted, pulling up into me and forcing an overshoot-we were in a classic rolling scissors(Image 5). As his nose committed I pulled up into him. In training I had fought in the same situation. I learned if my opponent had his nose too high I could snap down, using one G to advantage, then run out to his six o’clock before he could get turned around and get in range. As we slowed to 200 knots, I knew it was time to bug out….The MIG's superior turn radius, coupled with higher available G at that speed, started giving him a constant advantage. When he raised his nose just a bit too high in anticipation of the next roll, I pulled into him. Placing my aircraft nearly 180 degrees to follow, Willie and I were two miles ahead of him, out of his Atol missile range, at 600 knots airspeed. With our energy back, I made a 60 degree nose-up vertical turn back into the pressing MIG. He climbed right after us, and, again, with the Phantom’s superior climbing ability, I out zoomed him as he squirted BB s in our direction. It was a carbon copy of the first engagement seconds earlier as we went into another vertical rolling scissors. Again we were forced to disengage as advantage and disadvantage traded sides. As we blasted away to regain energy for the second time, Irish came up on the [intercom], "Hey, Duke, how ya doin up there? This guy really knows what he’s doin’. Maybe we ought to call it a day." This almost put me in a blind rage. To think some [bogey*] had not only stood off my attacks but had gained an advantage on me twice! Irish was all over the cockpit, straining to keep sight of the MIG as I pitched back towards him for the third time. Man, it felt good to have that second pair of eyes back there, especially with an adversary who knew what air fighting was all about. Very seldom did U.S. fighter pilots find a MIG that fought in the vertical. The enemy liked to fight in the horizontal for the most part, or just run, if he didn’t have the advantage. Once again I met the MIG-17 head-on(image 6), this time with an offset so he couldn’t use his guns. As I pulled up into the pure vertical I could again see this determined pilot a few feet away. Winston Churchill once wrote, "In war, if you are not able to beat your enemy at his own game, it is nearly always better to adopt some striking variant." My mind simply came up with a last-ditch idea. I pulled hard towards his aircraft and yanked the throttles back to idle, popping the speed brakes at the same time. The MIG shot out in front of me for the first time(image 7)!, the Phantom’s nose was 60 degrees above the horizon with airspeed down to 150 knots in no time. I had to go to full burner to hold my position. The surprised enemy pilot attempted to roll up on his back above me. 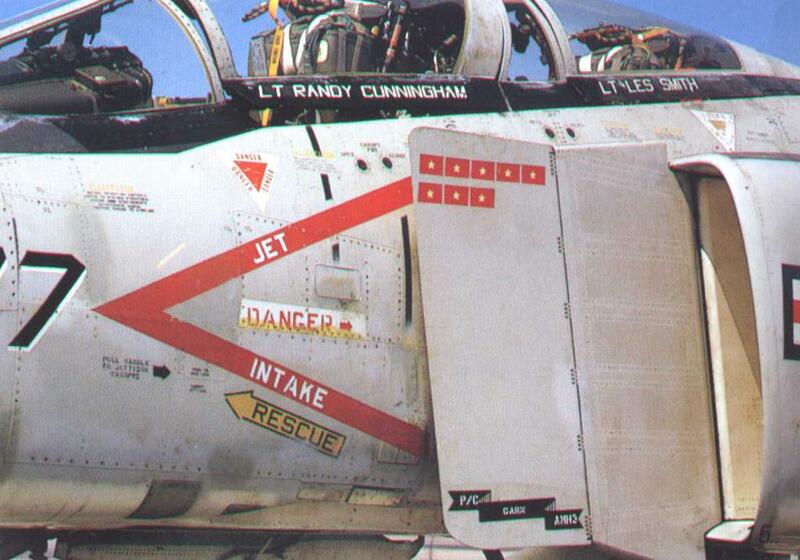 Using only rudder to avoid stalling the F-4 with the spoilers on the wings, I rolled to the MIG’s blind side. He attempted to reverse his roll, but as his wings banked sharply he must have stalled the aircraft momentarily and his nose fell through. Placing me at his six but still too close for a shot. "This is no place to be with a MIG-17," I thought, "at 150 knots...this slow, he can take it right away from you." But he had stayed too long. We later found out that this superb fighter pilot, later identified as "Colonel Tomb"(Initially misnamed as 'Toon') of the North Vietnamese Air Force, had refused to disengage when his GCI [Ground Control Intercept] controller ordered him to RTB [return to base]. After the war we found out that "Tomb" presumably with 13 American aircraft to his credit, had to run for it if he were going to get down before flaming out. He pitched over the top and started straight down. I pulled hard over and followed. Seeing he was attempting to disengage I rolled the lift vector over onto him and decreased the lateral seperation to obtain a firing position. Though I didn’t think a Sidewinder would guide straight down, with the heat of the ground to look at, I called "Fox Two" and squeezed one off. The missile came off the rail and went straight to the MIG. There was just a little flash, like bees flying off the MIG, and I thought it had missed him. As I started to fire my last Sidewinder, there was an abrupt burst of flame. Black smoke erupted from the Fresco. He didn’t seem to go out of control... the fighter simply kept descending, crashing into the ground at about 45 degrees angle." Randy "Duke" Cunningham was now the first ACE of the Vietnam War. 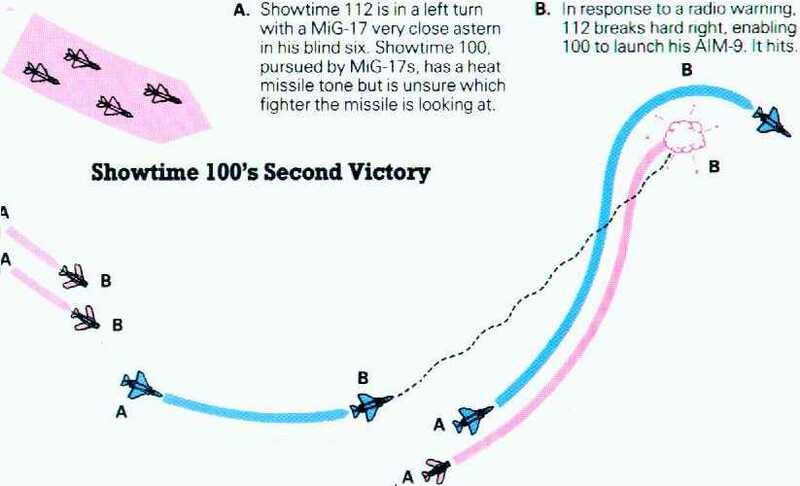 In a twist of fate, Showtime 100 was not to survive this mission despite being victorious in combat. While egressing the battle area Cunningham's F-4 was hit by a SA-2 SAM [surface to air missle]. Despite extensive damage, including the loss of both hydrolic systems, Duke was able to maintain a minimum of control by continually rolling the aircraft with the rudders[when a F-4 loses hydrolics it immediately pitches nose up and the only remaining utility system is the rudder] to enable them to stay with the crippled F-4. Fire warnings sounded in the cockpit, but all Cunningham and Driscole could think about was the real threat of becoming POWs[prisoners of war]. Each second longer in the cockpit was that much closer to the coast and rescue. Finally the last utility system failed and the Phantom went into a spin. 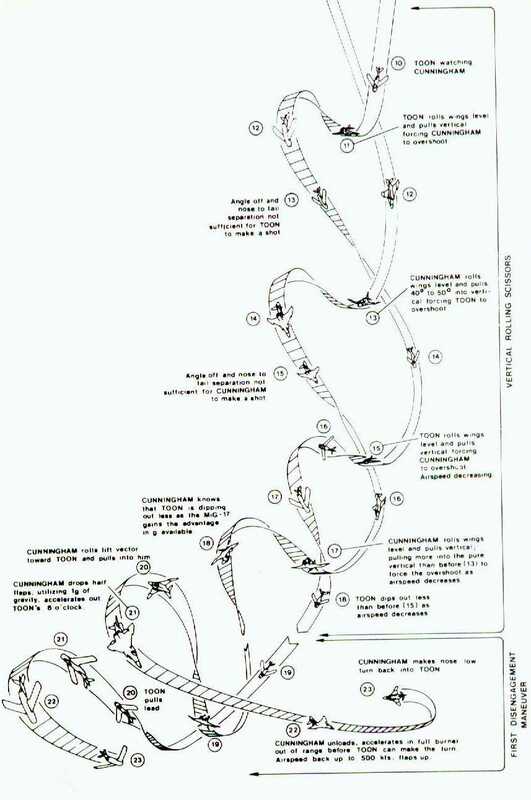 Cunningham deployed the drag chute, "I could see Ocean then land then Ocean then land. We were in a flat spin. I thought "Wind blows from Ocean to Land if we eject now we will be POWs". I told Willie to stay with me just a few more seconds as my radio filled with pleas from the other pilots to Eject!" Seeing that the drag chute was ineffective, Duke finally gave Driscole the order to eject,"I told Willie never to eject until he heard me say 'Eject! Eject! Eject!... I got out the word "Eje..." and BAM Willie was gone out of the aircraft!". After staying with the burning F-4 for over 30 miles, both pilots exited Showtime 100 just as it crossed the coast. The remainder of the strike group flew RESCAP[Rescue Combat Air Patrol] over them, discouraging several North Vietnamese vessels from entering the area as Marine helos plucked them both from the water and after a quick medical exam on the Hospital ship(where Cunningham discovered he had injured his back during ejection)returned them to the Constellation. * Politically corrected by the publisher... Initially read as "Goomers"